After developing Karoshi! and founding our own little company RAT KING we were searching for a small but cool challenge – and found it in the “Seven Day Roguelike Challenge”. This annual event took part from 05th to 13th March 2011. Because we had so much fun and surprised ourselves with the result of our 7-day long work, we decided to build an iPhone game out of it. And of course share our experience! The contest's noteworthiness for us: A roguelike has everything we normally DON'T like in games we play - randomness, permanent death with no reloading, and walking through generated dungeons hack'n'slaying monsters. But somehow, especially the short time span of seven days really made us euphoric. And we even did the whole game with 3D graphics (because I would be needless as an graphic artist otherwise). 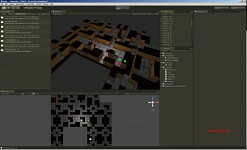 We worked with Unity3D, which is always a good choice for 3D game prototypes. Our main inspiration being board games, we tried to copy the style of various “real games” with cards, little flat chips and characters moving field-by-field. This also saved work and time which we otherwise would have had to invest in animations. To tell the truth: Before we took part in this contest this kind of gameplay was pretty new for me even though it's one of the oldest game genres around. But it is not a simple one at all, although the graphics are often plain ASCII symbols. For example, the player's character is presented as an @ and this definitely needs much imagination these days. On the other hand the game mechanics are often very complex life simulations, the most amazing example for this is “Dwarf Fortress”. 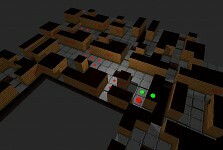 The first day Friedrich strongly focused on the card system, because the dungeons should be separated in such quadratic sections. When the player enters the edge of one of them he can choose to generate a fresh card – which then falls down together with various items and foes. The system is pretty open, and the number of tiles per card is mutable (5x5,7x7, etc.). The characters in this version are very minimalistic, and detailed only where it's needed. My lessons learned from this first day: Whenever you model a character – don't do it from the front/side perspective only, never forget to always check the appearance of the character in the way you see her/him in the game. Sounds quite logical, but in the work flow this was the main thing I often forgot. Thanks for reading, and check out a summary of the next development days – soon here on IndieDB! Good luck, company name is cool =D and the game looks fun!